Acupuncture is a traditional Chinese medicine (TCM) practice that originated thousands of years ago. It is based on the premise that a blockage or disturbance in the flow of the body's life energy, or “qi,” can cause health issues. Acupuncturists insert hair-thin needles to specific acupuncture points throughout the body to restore the flow of qi, balance the body’s energy, stimulate healing, and promote relaxation. According to TCM theory, there are over 1000 acupuncture points on the body, each lying on an invisible energy channel, or “meridian.” Each meridian is associated with a different organ system. Researchers don't fully understand how acupuncture might work, but there are numerous theories. One theory is that acupuncture works by stimulating the release of endorphins, the body's natural pain-relieving chemicals. Acupuncture is also said to influence the autonomic nervous system (which controls bodily functions) and the release of chemicals that regulate blood flow and pressure, reduce inflammation, and calm the brain. Some people use acupuncture to promote fertility. It is also used to quit smoking and as a component of the treatment for other addictions. Cosmetic acupuncture, also known as facial acupuncture, is used to improve the appearance of skin. For a report published in the Annals of Internal Medicine in 2017, researchers analyzed previously published trials on the use of non-pharmacologic therapies (including acupuncture) for low back pain. The report's authors found that acupuncture was associated with decreased pain intensity and better function immediately after acupuncture treatment, compared with no acupuncture. In the long-term, however, the differences were small or were not clear. Noting that the strength of the evidence was low, the authors found "limited evidence" that acupuncture is "modestly effective for acute low back pain." In a 2016 review published in the Cochrane Database of Systematic Reviews, scientists reviewed 22 previously published trials (involving 4985 participants). In their conclusion, they found that adding acupuncture to the treatment of migraine symptoms may reduce the frequency of episodes, however the size of the effect is small when compared to a sham acupuncture treatment. A 2016 review (involving 12 trials and 2349 participants) suggests that acupuncture involving at least six sessions may help people with frequent tension headaches. In two studies, acupuncture added to usual care or treatment at the headache onset only (usually with pain medication) resulted in decreased headache frequency compared to those given usual care only. The researchers note that the specific points used during treatment may play a less important role than previously thought, and that much of the benefit may be due to needling effects. 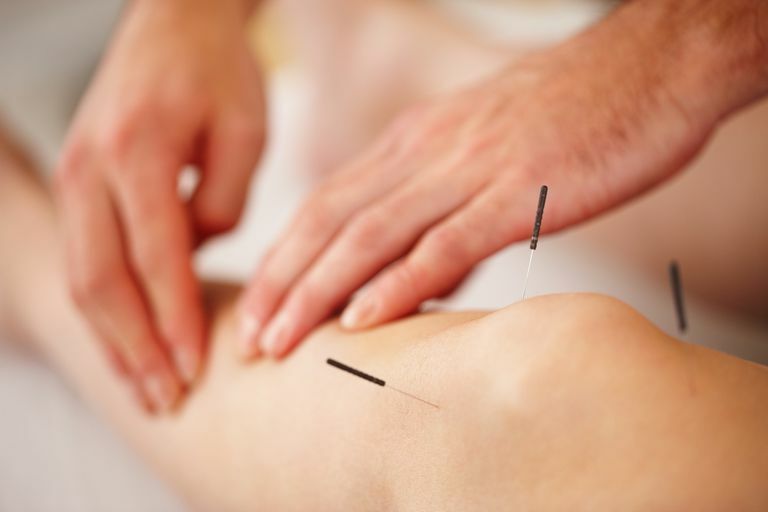 An analysis of previously published studies found that acupuncture improved physical function in the short and long term in people with chronic knee pain due to osteoarthritis, but it appeared to provide only short-term (up to 13 weeks) relief of pain. Another review, published in JAMA Surgery, analyzed previous studies on non-pharmacological interventions for pain management after total knee arthroplasty and found evidence that acupuncture delayed the use of patient-controlled use of opioid medication to relieve pain. Before the initial appointment, you will be asked to complete a health history. The acupuncturist begins the visit by asking you about your health concerns, diet, sleep, stress level, and other lifestyle habits. You may be asked about your emotions, appetite, food likes and dislikes, and response to changes in temperature and seasons. During your visit, the acupuncturist will examine your appearance carefully, noting your complexion, voice, and tongue color and coating. He or she will take your pulse at three points on each wrist, noting the strength, quality, and rhythm. In Chinese medicine, the tongue and pulses are considered to reflect the health of your organ systems and meridians. Typically, an acupuncture will use six to 15 tiny needles per treatment (the number of needles doesn't indicate the intensity of the treatment). The needles are often left in for 10 to 20 minutes. The acupuncturist may twist the needles for added effect. Moxibustion. Also known as "moxa," moxibustion involves the use of heated sticks (made from dried herbs) held near the acupuncture needles to warm and stimulate the acupuncture points. Cupping. Glass cups are applied to the skin so that there is a suction effect. In TCM theory, cupping is used to relieve stagnation of qi and blood. Herbs. Chinese herbs may be given in the form of teas, pills, and capsules. Electroacupuncture. An electrical device is connected to two to four acupuncture needles, providing a weak electrical current that stimulates the acupuncture needles during the treatment. Laser acupuncture. Said to stimulate acupuncture points without the use of needles. Ear acupuncture, also known as auricular acupuncture, is sometimes used during the treatment for weight loss, smoking cessation, addictions, and anxiety. Although the length of the acupuncture session can vary from a few minutes to over an hour, the typical treatment length is 20 to 30 minutes. The initial visit may take up to 60 minutes. After the treatment, some people feel relaxed (or even sleepy), while others feel energetic. If you experience any unusual symptoms, you should consult your doctor. You may feel a slight sting, pinch, ache, or some pain as the acupuncture needle is being inserted. Some acupuncturists manipulate the acupuncture needle after it has been placed in the body, by twirling or rotating the needle, moving it up and down, or using a machine with a small electric pulse or current. Some acupuncturists consider the resulting tingling, numbness, heavy sensation, or ache (known as "de qi") desirable in achieving the therapeutic effect. If you experience pain, numbness, or discomfort during the treatment, you should notify your acupuncturist immediately. As with any treatment, acupuncture does pose some risks, the most common being pain and bleeding from the insertion of acupuncture needles. Other adverse effects can include skin rashes, allergic reactions, bruising, pain, bleeding, nausea, dizziness, fainting, or infections. In order to reduce the risk of serious adverse effects, acupuncture should always be administered by a licensed and properly trained practitioner using sterile, disposable needles. According to a report published in Scientific Reports, acupuncture can cause serious adverse effects, such as infections, nerve and blood vessel injury, complications from needle breakage or remnant needle pieces, punctured organs, central nervous system or spinal cord injury, hemorrhage, and other organ and tissue injuries resulting in death. Punctured pleural membranes around the lungs can lead to collapsed lungs. People with a rare, anatomical variation known as sternal foramen (a hole in the breastbone) are at risk of lung or heart (pericardium) puncture. There have been some reports of needles being left in after the treatment. A report published in the Bulletin of the World Health Organization summarized the acupuncture-related adverse effects in Chinese language studies. Acupuncture may not be right for people with certain health conditions. The risk of bleeding or bruising increases if you have a bleeding disorder or are taking blood thinners, such as warfarin (Coumadin). Acupuncture shouldn't be used in place of standard care. Avoiding or delaying standard care may have serious consequences. If you are having difficulty managing pain or other health issues with conventional methods, acupuncture may be worth a try. Just be sure to check with your doctor first to discuss whether it's appropriate for you. Chou R, Deyo R, Friedly J, et al. Nonpharmacologic Therapies for Low Back Pain: A Systematic Review for an American College of Physicians Clinical Practice Guideline. Ann Intern Med. 2017 Apr 4;166(7):493-505. Lin X, Huang K, Zhu G, Huang Z, Qin A, Fan S. The Effects of Acupuncture on Chronic Knee Pain Due to Osteoarthritis: A Meta-Analysis. J Bone Joint Surg Am. 2016 Sep 21;98(18):1578-85. Linde K, Allais G, Brinkhaus B, et al. Acupuncture for the prevention of episodic migraine. Cochrane Database Syst Rev. 2016 Jun 28;(6):CD001218. Linde K, Allais G, Brinkhaus B, et al. Acupuncture for the prevention of tension‐type headache. Cochrane Database of Systematic Reviews 2016, Issue 4. Tedesco D, Gori D, Desai KR, et al. Drug-Free Interventions to Reduce Pain or Opioid Consumption After Total Knee Arthroplasty: A Systematic Review and Meta-analysis. JAMA Surg. 2017 Oct 18;152(10):e172872.